“Caring with Dignity” is our pledge and promise. Striving to make our residents and their loved ones feel part of a larger family through dedication, experience, and respect. Tri-State Village is proud to offer a wide range of services to assist our residents in achieving their healthcare goals. The amenities we provide make our center comfortable and enjoyable. From our many activities to the beautiful surroundings, the atmosphere at Tri-State is second to none. We understand that the transition to a skilled nursing facility can be challenging. 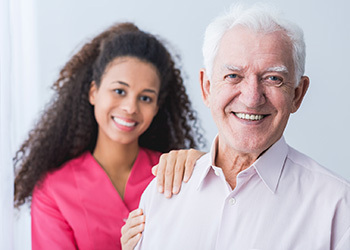 At Tri-State Village Nursing and Rehabilitation Center, we strive to ease the process by providing an environment where residents and guests feel informed and comfortable. Visitors are welcome every day of the week. Schedule a tour today. Please contact us to learn more about the unique, sophisticated healthcare environment at Tri-State Village Nursing and Rehabilitation Center.